The is a pure electric plug-in vehicle, and can be recharged in about 7 hours. 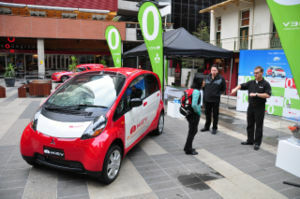 The engine uses no petrol and does not produce any greenhouse gas emissions when it is used, and if recharged using renewable energy, emits zero emissions. The car will be manufactured in Japan. As of April 2009, about 20 prototypes have been constructed. The first production run of 2,000 is expected to roll off the assembly line towards the end of 2009, and go on sale in Japan by June 2010. No availability date is known for Australia yet. The specially made lithium ion batteries hold approximately 16 kWh of electricity which yields a range of up to 160km. 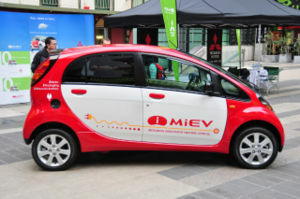 The cost per kilometer to drive the i MiEV is one third that of a comparable petrol vehicle. Approximately 30% of the CO2 emissions of a petrol minicar, even taking into account CO2 emissions at power plants that generate the power needed for charging it.